You may remember Adly, a startup that in-stream ad network for celebrities and brands on social platforms like Twitter and MySpace. The company was also helping celebs promote brands on Facebook, but got the boot from Facebook (read more about why here). For background, Ad.ly links up advertisers with influencers and celebs and then distribute links to marketing campaigns through the celeb’s Tweet streams and MySpace updates streams with full disclosure. Today, the company is launching an analytics dashboard which is designed to help top influencers manage and grow their audiences on Twitter. The dashboard provides brands and celebrities with audience demographics of their followers and reveals who your top influencers are, which influencers and fans are messaging you, mentioning you, and retweeting your content. 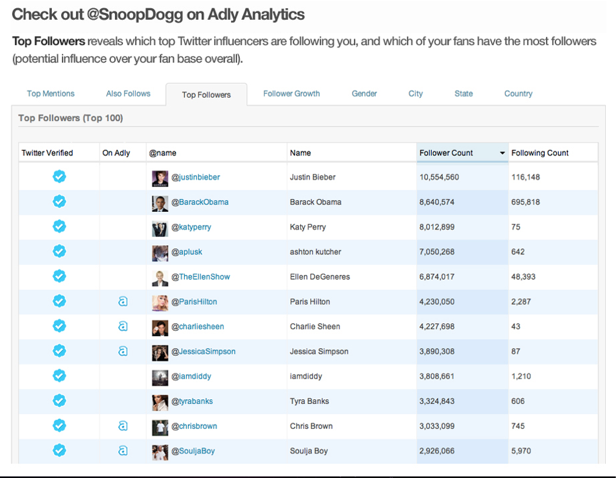 Adly will also show you which other celebrities and brands your fans follow, and how many fans you share in common. You can see who your “Mega Fans” are (the ones with the greatest reach and potential influence); follower growth over time, the gender breakdown of a follower base compared to the average Twitter audience, and the geographic breakdown of an audience compared to that of the average Twitter audience. 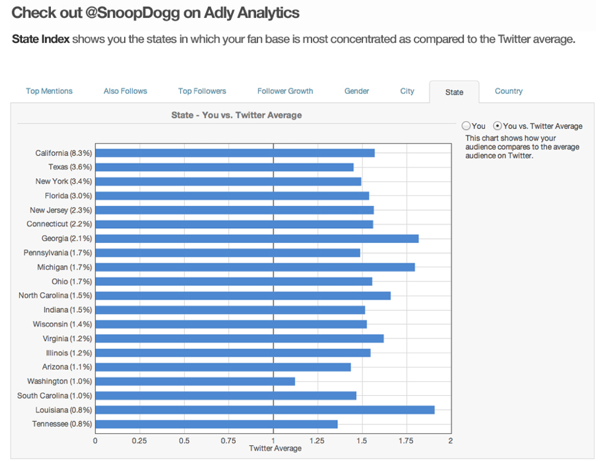 Adly Analytics also allows celebrities and brands to grant managers, agents and staff access to their Adly Analytics without sharing their Twitter passwords. There’s no doubt that analytics are now integral to any brand’s social media strategy. There are a number of startups that offer in-depth social media analytics such as Viralheat, HootSuite, PeopleBrowsr, Netvibes and Topsy. And we’ve seen some pretty major exits in the social media analytics world, including Radian 6 and Kosmix. Providing analytics alongside Adly’s ad and endorsement platform, makes sense. Of course, we know Twitter could have its own high-powered analytics platform in the works, especially considering the company’s recent purchase of social media analytcis startup BackType as well as last year’s acquisition of Smallthought. For now, Adly doesn’t seem to be in danger of violating Twitter’s advertising TOS. But Twitter hasn’t been the most developer-friendly company, and has cracked down on some companies using advertising on the platform. Adly also hasn’t written off recently acquired Myspace yet. Adly CEO Arnie Gullov-Singh believes Myspace may have comeback, especially when it comes to engaging celebs. Perhaps that’s why JT’s on board?